I’ve written thousands of words over the years about OPH (Operation Politically Homeless) — the classic Advocates outreach tool. If a picture is worth a thousand words… well, here’s a photo that pretty much says it all about OPH. The OPH was conducted by the Alabama LP at the 23rd annual Irondale Alabama Whistle Stop Festival on Saturday September 27, 2014. Crowds filled the streets to enjoy artists, crafters, food vendors and musicians from all over the Southeast. How great that OPH was there, too! 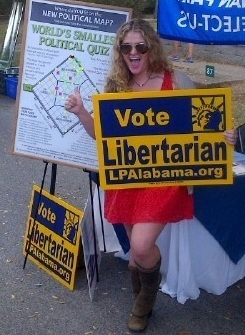 And you can see by the dots at the top of the OPH chart that the Alabama LP found quite a few libertarian-leaning folks there. Congratulations! This picture perfectly illustrates what libertarians have been saying for years about this fantastic tool. OPH is fun. OPH draws crowds. OPH lets just two or more libertarians find lots of libertarian-leaning people wherever people are gathered — and helps you easily recruit them into your organization. OPH can be done by newcomers and old hands alike. It’s a great way to take the ideas of liberty to your community or campus. Learn more about how YOU can put the awesome proven power of OPH to work for your organization. Students: Learn how your campus organization can get a FREE OPH kit — and join the hundreds of libertarian campus groups using OPH to find thousands of new libertarians.